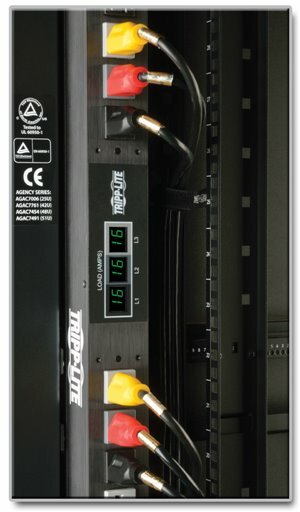 Efficiently distribute and monitor power in data center environments with Tripp Lite's PDU3MV6L2120LV 3-Phase Metered Power Distribution Unit. Unfiltered electrical pass-through makes the PDU3MV6L2120LV ideal for distributing alternate waveform utility, UPS or generator power in rack enclosures and network closets. And with three digital meters, you’ll always know the current draw of connected equipment. The PDU3MV6L2120LV provides reliable 120V power service via 42 5-15/20R outlets arranged in three single-phase output load banks. This PDU has a rugged all-metal housing and a 6 ft. power cord with L21-20P twist-lock plug. Load capacity is 5.7kW. Three digital load meters that provide the current level (in amps) of connected equipment in each load bank. The meters help ensure the PDU is used at maximum capacity with no danger of overload. The PDU3MV6L2120LV is easy to integrate with a wide range of data center and network applications. It can be configured for 0U (vertical) rack installation with the included mounting brackets, and it also supports toolless button-mount vertical installation in compatible rack enclosures. Vertical 0U installation reduces cord clutter and promotes efficient airflow through the rack. The PDU3MV6L2120LV is compliant with the Federal Trade Agreements Act (TAA) for GSA Schedule purchases. The PDU3MV6L2120LV comes backed by a 2-year warranty. It’s manufactured in compliance with strict RoHS specifications, reflecting Tripp Lite’s commitment to environmental responsibility.